I know this isn't game of thrones but has a card ever used the term thrice before???? Thrice is used on the Alternative Historian errata. oh if it is then okay (: I just thought they were randomly changing the format. Danigral - 3 out of 5. Card draw anywhere is hard to overlook, but this is struggle based card draw and therefore easy for your opponent to work around - He can just destroy the Crooked Cop in Operations.. However, if you have extra repeatable actions, say like San Marco’s Basilica, you can draw off your own effects too. mnBroncos - 4 out of 5. Even more protection. Hastur is the king of cancel. Agency is now the king of protection. Obtuse - 3 out of 5. A neat theme for a character. Another card to run in an Agency/Syndicate mash up. Card draw is always nice. WWDrakey & Ire - 3 out of 5. Well, the draw-engine is cute and all, but also quite easy to play around or break apart. And then you're easily left with a 2-combat icon 3-cost character, which just isn't that much. Has anyone successfully integrated this card in a good deck? Seems to combo well with Paul Lemond, Sam Marco Basilica and Shotgun. I haven't, but I think it's possible. It would take some effort on your part, as mentioned in the reviews above, but it seems like it could be done. Since he's a criminal, maybe he could be paired up with Lena and Street Tough in a Brown/Blue deck. Or, like you said, go more of a Blue route with the Basilica, Paul Lemond, etc. 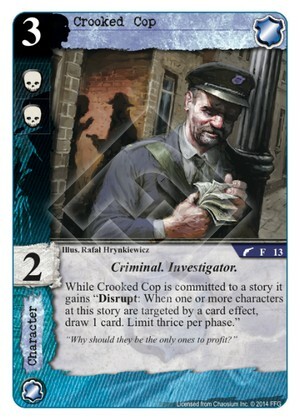 My main problem with Crooked Cop is that he costs 3. Since 3 is the sweet spot for characters in this game, there are a lot of other 3-cost characters that I'd rather put into a deck instead of Crooked Cop. Someone with better icons, better skill, or a more reliable or game-changing ability. I just don't feel like the juice is worth the squeeze with Crooked Cop. Your right about the 3 cost. If he could work in a Brown/Blue deck like you said, it would be with the help of Johnny V's Dame to lower his cost.